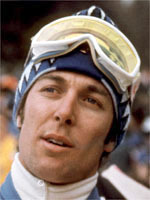 Gustavo Thoni of Italy was undeniably the man to beat in giant slalom and slalom competition between 1970 and 1975, during which time he won an Olympic gold medal, two world championship titles and four overall World Cup titles. His giant slalom victory at Val d'Isere in 1970 marked the beginning of a golden period during which the elegant Italian won 24 World Cup races. But things did not all go the Italian's way at the start. The pressure proved too much for him at the world championships on his home slopes of Val Gardena in 1970 and he finished a disappointing fourth in the slalom and failed to complete the giant slalom event. But the Italian's World Cup success in 1971 and 1972, when he won the overall title (also in 1973, 1975), was proof that greater things were possible and he won the ultimate prize at the 1972 Winter Olympics in Sapporo, taking the giant slalom gold medal. With Thoni's favoured slalom event to come there was suddenly a possibility that he could achieve a magnificent double. But his thunder was stolen by a remarkable first run by the Spanish outsider Francisco Fernandez-Ochoa, who humbled both Thoni and his cousin Rolando. By the time Thoni had gathered his wits it was too late and in the second heat, despite an equally brilliant run of his own, he was unable to oust "Paquito" Fernandez Ochoa who became the first Spaniard ever to win a Winter Olympics medal. Thoni had to settle for silver, with Rolando only 2/100ths of a second behind in third. Thoni went into the 1974 world championships at St. Moritz in Switzerland with three World Cup titles under his belt and it was no surprise when he finally achieved the elusive double. At the 1976 Games in Innsbruck, he was bundled out of the medal standings in the giant slalom but did bounce back to take a fine silver in the slalom behind the surprising Italian Piero Gros. Gradually being pushed into the shade by the great Swede skier Ingemar Stenmark, Thoni's star was on the wane and although the Italian competed at the world championships in 1978 as well as the Lake Placid Olympics two years later, he was a spent force. Thoni had not had his last word on the Olympic stage though, as he was to coach countryman and ski-ing giant Alberto Tomba from 1989 to 1996. He then settled in his native town of Trafoi in the Dolomites mountains with his wife Ingrid and three daughters. Fans of Thoni still occasionally get the chance to see him in action when he takes part in the 'legends' races.